The news of the day: It’s Friday! It’s been windy and rainy . . . that really wet, cold rain that always seems to find a way to get at least one drop down by neck while I wait for Miss Pink to find the perfect spot. If you are getting a little house bound and in need of motion head over to class today. In Ilwaco Pam will lead you in Gentle Stretch at 10:30 am which may appear subtle at first; but, will stretch and ... See More tone from head to toe and allow you to challenge everything in between while promoting your sense of balance. In Astoria there are two classes with Dave on different ends of the spectrum. Starting at 8:00 am he will lead you through his signature class entitled Easy Morning Stretch which is exactly what it says. Easy moves, great music, satisfying stretches . . . making you very happy you got out of bed and made your way to the studio. But, wait, there’s more. At 11:00 am he presents Pound, Move and Stretch. 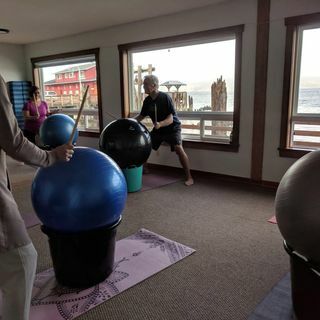 Drum sticks, stability balls, fun playlist and laughter. It’s hard to describe in a few words. If you haven’t been, come check it out. It’s an aerobic, strength building, breath workout that will relieve your frustrations and put a smile on your face. You don’t need to be a drummer. You don’t need to be an experienced yogi. If you are grumpy you will leave with a smile on your face. Come and prove me wrong . . . I’ll be there today! Feel free to post your comments on Facebook at RiversZen Online Community or email us at info@riverszen.com or text or call us at 503-440-3554.